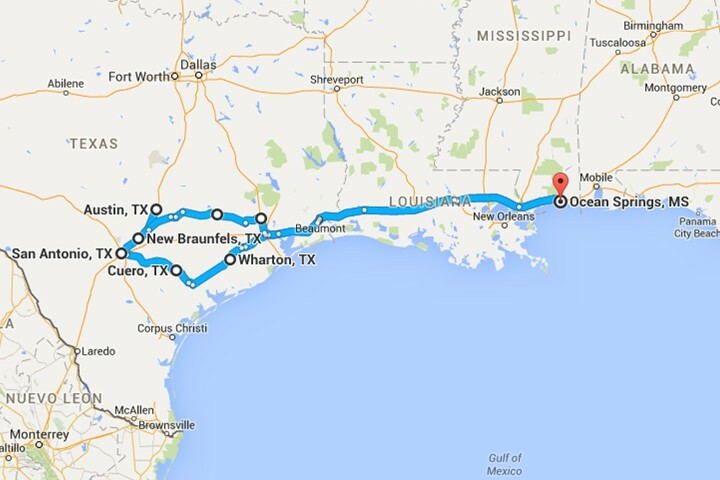 Here's a map of our Texas trip. We drove a lot the first day with stops in Rayne, Louisiana, the Texas welcome center, and somewhere south of Houston for gas before reaching our hotel for the night in Wharton, Texas. In an effort to avoid the bad weather coming through, we took a scenic route to San Antonio to visit the missions all day before stopping in New Braunfels, where we stayed two nights. The next day we took a trip to Austin to see the state capitol and University of Texas campus. On the way back to New Braunfels, we took a glass-bottom boat tour in San Marcos. 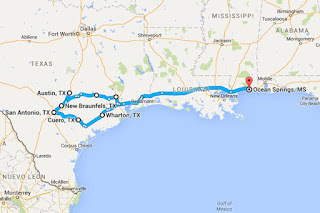 The following day we set our sights on Houston with a stop at Blue Bell Creamery in Brenham along the way. We stayed in a suburb north of Houston with a friend. It was nice to have a tour guide and extra set of hands during our time in Houston. After 5 nights in Spring, we returned home to the Mississippi Coast. More details on our stops coming soon!